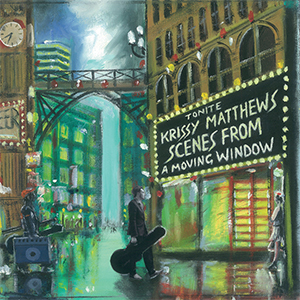 Starting his career at the age of twelve, Krissy Matthews set out to leave a mark on the world of blues music from a very young age. Like Joe Bonamassa, he possesses a great talent and feel for the genre and his instrument, but unlike Bonamassa, he is far more selective with regard to the speed of which he records and releases albums. Despite only being twenty two at the time of this album’s release, ‘Scenes From a Moving Window’ marks the end of a four year studio silence. It also marks a step up in the bluesman’s fortunes, having secured the legendary Cream lyricist Pete Brown (Piblokto/Moving Ornaments) as co-writer on eleven of the album’s tracks.